Heat the oil in a medium saucepan over medium heat. Add the chorizo and garlic and cook, stirring occasionally, for 3–4 minutes or until golden and crisp. Remove from the pan and set aside. Add the tomatoes, stock, pumpkin, salt and pepper to the saucepan and cook for 12 minutes or until the pumpkin is tender. Remove the pan from the heat and leave the mixture to cool slightly. Blend until smooth. Return the soup to a medium heat, add the black beans and cook until heated through. 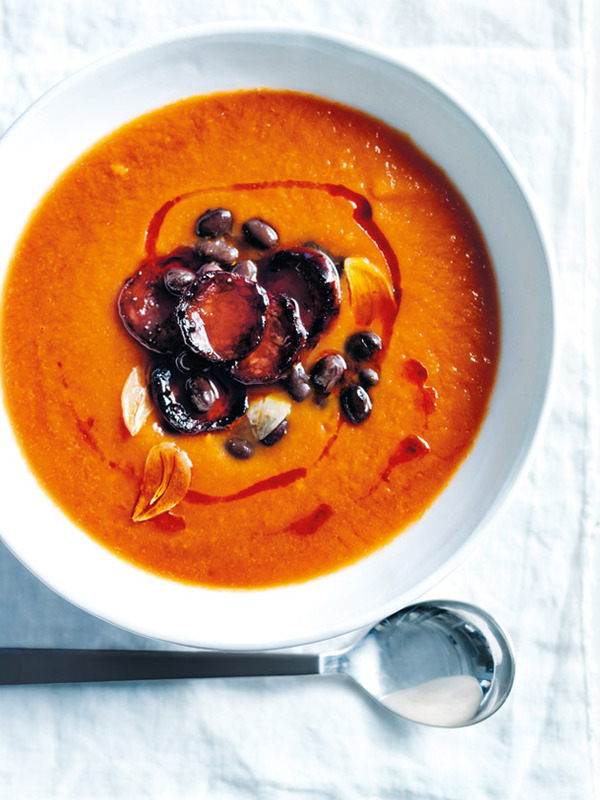 Top the soup with the chorizo and garlic and drizzle with extra oil to serve. Serves 4–6.